It’s been a busy few months with multiple tiny house improvements to better enjoy (and get relief) from the hot Texas summer. 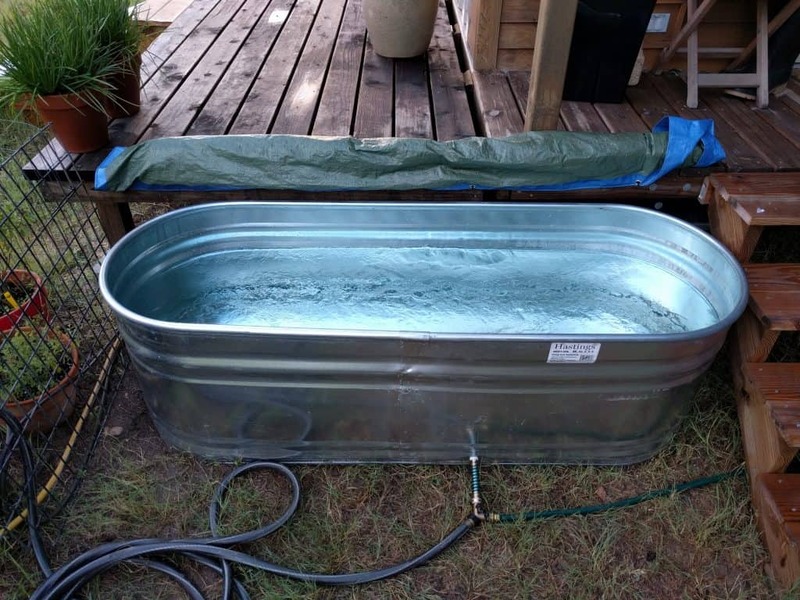 Second, to cool off from the summer heat, we’ve built ourselves an outdoor pool!…er….tub? Cold plunge? Whatever you want to call it, it’s spectacular! I had a poolside sushi dinner the other evening, and it was amazing! Feels like vacation, just one step off my deck! We created this (as many others have) from a standard galvanized water trough (AKA “stock tank”). We got the 2x2x6′ version so two people can easily fit (and stretch out) at the same time. We rigged this “pool” with a simple hose splitter, allowing to both fill and drain the water from the single drain on the side. Less than $150 for all parts, and it was super easy to set up! But wait — there’s more! I also finally got around to granting Lee her wish for an indoor yoga sling. Instead of buying new “yoga silk” (really just nylon) I simply hung a my beloved ENO hammock from the ceiling. 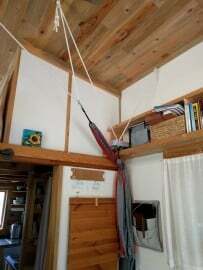 I devised a simple method of distributing the weight as widely as possible over the full length of the roof rafter, using 3 eye bolts (really “screw eyes”) with some triangulated ropes, creating nearly perfect hanging width and weight distribution. I’m very happy with how it turned out! We also use it for laying down and lounging while watching TV or movies. So comfy and great for inversions and other healthy yoga postured as well. Fun! To keep the yoga sling out of the way when not in use, it’s moved to the corner of the room and hangs over a large storage hook, tucked away very nicely. 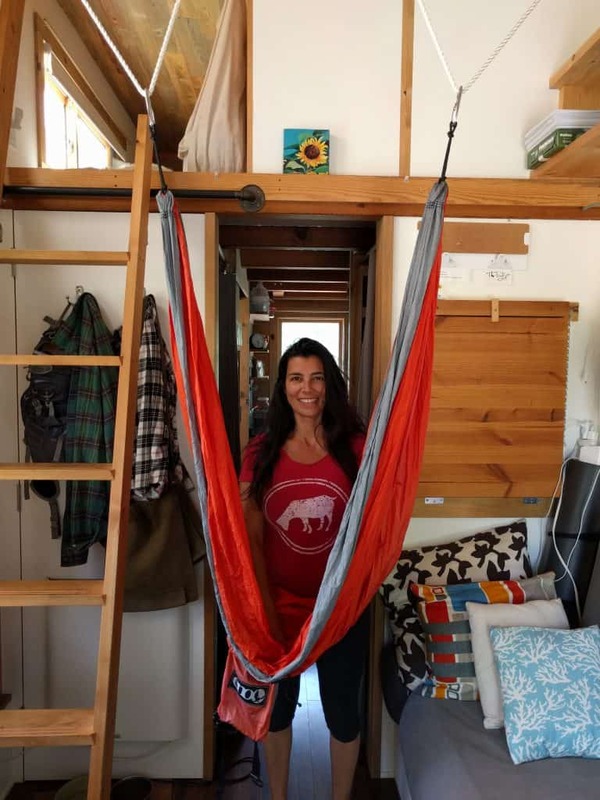 After completing any of these projects I’m reminded of one of the many benefits of building your own tiny house: once you build a house, other smaller construction project seem very simple and easy. I realize not everyone could either design or build this stuff. But going through the tiny house design and building process, you really learn an incredible amount and pick up many, many skills along the way. Here’s to being handy! I’ve leave you with a photo gallery of life in our tiny house this summer, with with more images of all this fun stuff (Christmas in July, we call it). Enjoy! What have you created to better enjoy your summer? The yoga sling is a real cool idea. Truck camper. 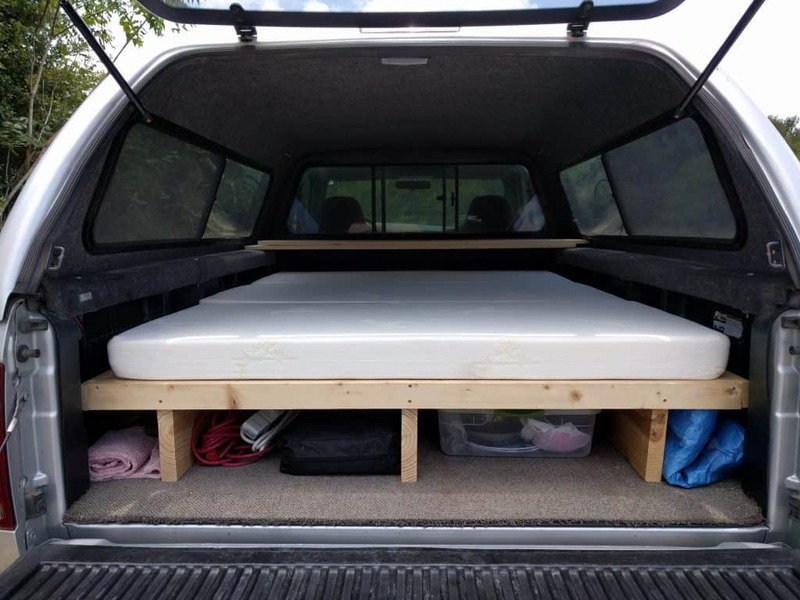 What a great idea with putting the mattress up on a platform that allows storage underneath.